Reverse graffiti Written on August 25, 2008, by Ingeborg. Is graffiti pollution? Not in the way Alexandre Orion does it. 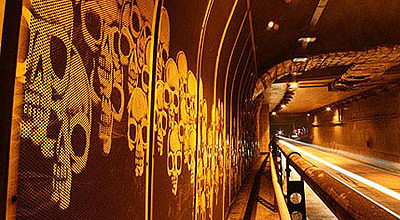 In the Sao Paolo tunnels that are blackened by exhaust gasses, he paints thousands of skulls by wiping away the soot. His graffiti draws attention to pollution. And cleaning can never be illegal, now can it? Few people know he washes the cleaning cloth and paints canvasses with the soot. Now that’s what I call superuse.